Edmonton-based blackened death metal warriors Weapon are making some big strides to get their vehemently intense music heard. Namely, the band have announced they've signed with metal giant Relapse Records. Weapon are currently writing the follow-up to last year's From the Devil's Tomb. The upcoming album, which will be their third, will be their Relapse debut. No word yet on when that new record will drop, but when it does, expect more severe extreme metal from the dudes who brought us tunes in the past such as "Cacophony! Black Sun Dragon's Tongue!" and "Within the Flesh of the Satanist." 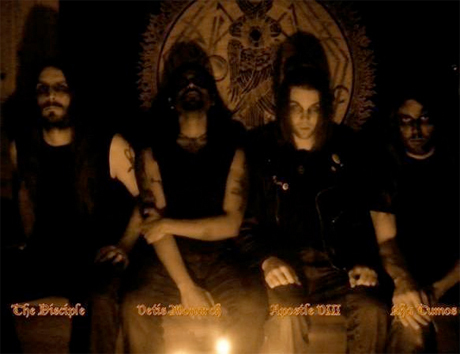 In a press release, guitarist/vocalist Vetis Monarch said that "all our supporters can rest assured that the new material is a direct continuation of the sinister and violent music we have delivered thus far," before adding, "Onwards and upwards by the blessing of Lucifer..."
While fans wait for new material, the band will be playing a handful of Western Canadian dates at the end of August and start of September with California retro thrash metal crew Holy Grail and Portland's crossover titans Toxic Holocaust.